1. The Governor or a Pirate? When Tara saves The Governor in season 4, she has no idea about the turmoil she’s started. But to add a little humor to ease the tension, we can see David Morrissey lying on the ground with his trademark eyepatch on. Did you spot the parrot pillow behind him? The bird was strategically placed, perfectly perched on his shoulder to make the villain look like a true pirate. It seems The Walking Dead has a fan in heavy metal band member, Scott Ian. Did you know that he played a walker that Carl killed outside Alexandria in season 5? He is so much of a fan that he also played a zombie four years earlier! Yes, the show does cleverly connect to the games! In season 4, Michonne considers heading to Macon. This is also the hometown of the protagonist, Lee Everett, of Telltale Game’s The Walking Dead: Season 1. Let’s just say it’s a good idea that no one from the Survivors went there! They didn’t let this one slip by us! There are a few nods to George A Romero’s Dawn of the Dead! In fact, there’s more than one cameo from the movie! One of the most iconic zombies of all time, Bub, who regains his humanity in the film is seen trapping Tara and Glenn in a tunnel in season 4. And we can’t forget Flyboy who also makes an almost identical-looking return. 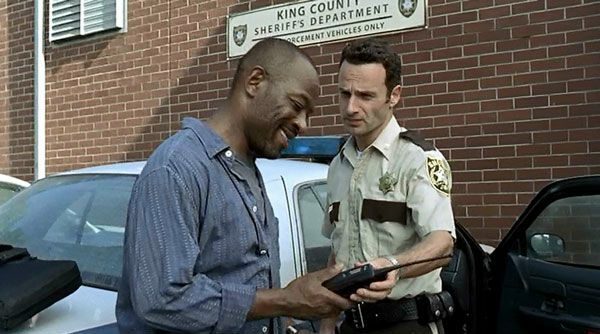 As fans might recall, Rick Grimes worked for the King’s County Sheriff’s Department before the apocalypse. The name ‘King’ is no random choice by the show’s creators. It’s a tipping of the hat to famous horror author, Stephen King, by the show’s front-runner, Frank Darabont. Turns out the two are good friends! In season 1, Carl Grimes can be seen wearing a t-shirt with a paw print on it. This a direct tribute to TWD comic-book writer Robert Kirkman’s character, Science Dog – yet another creation from his Invincible comic series. Of course Carl would have been a fan! When T-Dog (remember him?) was infected in season 2, Daryl came to the rescue with a veritable pharmacy of drugs from his bike bag. If you looked close enough, you’d have noticed that it was identical to Breaking Bad’s Walter White’s infamous blue meth! The two shows belong to AMC so it’s no surprise that the show’s creators decided to give fans a fun teaser like this. He might not shockingly exist in the comics, but Daryl has quite a few significant Easter Eggs under his belt. In season 6, we see Daryl walk through a glade of slain zombies. Out of the back of one of the zombies blooms a flower. Not just any flower, but a Cherokee rose. This is the same flower Daryl gave Carol back in season 2 to comfort her when Sophia disappears. Sweet! Do one of these three heads look familiar? That’s because the one on the far right is a replica of Johnny Depp’s head! It seems that Depp’s permission may not have been involved – Greg Nicotero, executive producer, told Entertainment Weekly – “One of the other heads, I don’t know if I’m going to get in trouble if I say this, was Johnny Depp.” What an interesting, but rather strange choice. In one of the saddest TWD scenes, we see Tyrese Williams bleed out in the back of a car. While this happens, we hear the voice of an English person reporting about the zombie apocalypse from the radio. This voice is, in fact, belongs to none other than Andrew Lincoln. In case you didn’t know, yes, Rick Grimes is British in real life. How did we not recognize that signature voice?! In the 100th episode of The Walking Dead, show-runners thought they’d add a few teasers and fun callbacks to earlier seasons. In Rick Grime’s flash-forward to a perfect Alexandria, we see him as an older man lying in a bed and waking up with a vase of flowers next to him. Bringing to mind one of the best Walking Dead moments, this scene is a clear mirroring of the very first episode when Rick wakes up in a hospital at the beginning of the apocalypse and sees a vase of dead flowers. Again, in the 100th episode, we see Father Gabriel and Negan completely, and seemingly impossibly, stranded in a container surrounded by walkers. This harks back to the first episode where Rick is also totally trapped in a tank with hundreds of walkers, showing the same aerial view. Memories! 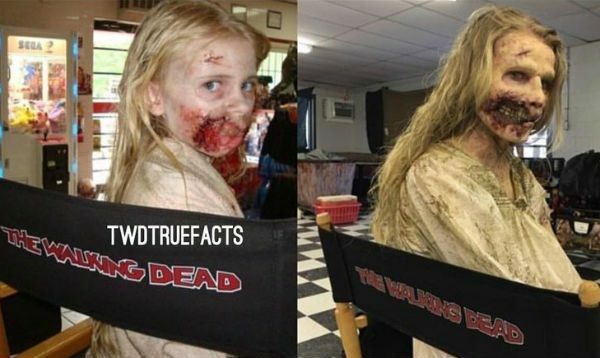 Remember the ‘little girl’ walker that Rick and Carl encounter in the season 1 premiere? You may have recognized the same actress, now 17, and now an older-looking walker, at the abandoned gas station in the season 8 premiere. Looks like nobody’s killed her off yet. But wait, did you know that walkers age? Here’s a super-cool Easter Egg that few would have noticed! In season 4, Beth stumbles across a group of annihilated walkers in a clearing. Next to one of the bodies is a baseball bat wrapped in barbed wire, clearly a nod to Negan and Lucille’s future appearance! Wow. If only we knew what terror was to come. Indeed. The Walking Dead and The X-Files somehow interlink. Or so you could say. 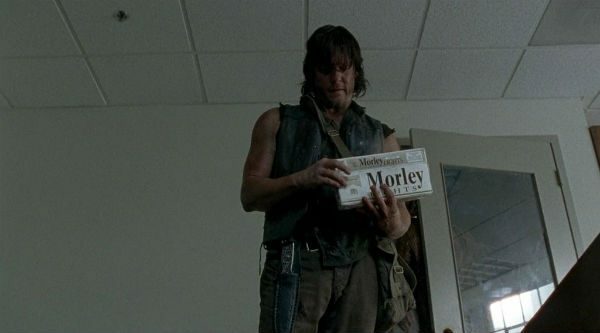 Daryl is regularly seen with packs and large stashes of ‘Morley’ cigarettes on the show. This is in fact, the same brand that The Cigarette-Smoking man in The X-Files liked smoking. Cool, huh? In season 6, we see Eastman wearing a Save the Terrapins t-shirt. This was no random outfit choice by the show’s creators. In actual fact, Eastman is a nod to the creator of The Teenage Mutant Ninja Turtles, Kevin Eastman. That’s not all. Eastman ironically wears the shirt after we see Enid savagely eat a turtle. Now that’s what you call two cleverly hidden references! It’s hard to catch, but it’s there! Some fans believe that the X-Box ‘Achievement Unlocked’ sound can be heard in Rick’s first ever zombie kill. Avid gamers would have needed the ears of a hawk to notice this one! We’ve had a Dawn of the Dead character and an X-Files and Breaking Bad reference. What could possibly be missing? A fairy-tale character in The Walking Dead, of course! Yes, Little Red Riding Hood was intentionally and smartly placed in season 5 when we were being introduced to the Wolves. Smart, indeed! 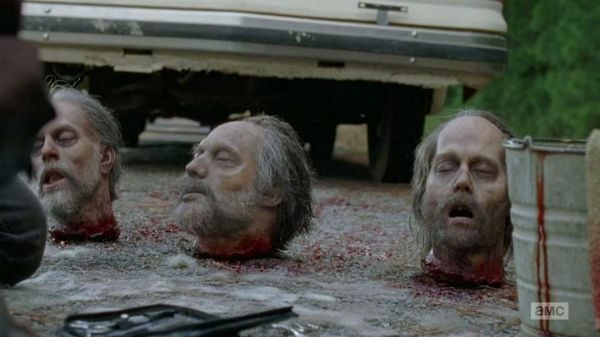 These TWD Easter Eggs were well hidden, for the most part, as the crew clearly like to keep things subtle. If you managed to spot them all, consider yourself a true fan! Are there any other hidden secrets and inside jokes that we might have missed? Let us know in the comments! Want a laugh? Need a fun break from all the seriousness? Check out the funniest Walking Dead memes – they’ll make you laugh your guts out! Morley is a Fox Channel brand of cigarettes, not only The X Files brand.